Explore the motion of particles as they bounce around from one side of a room to the other through an adjustable gap or partition. 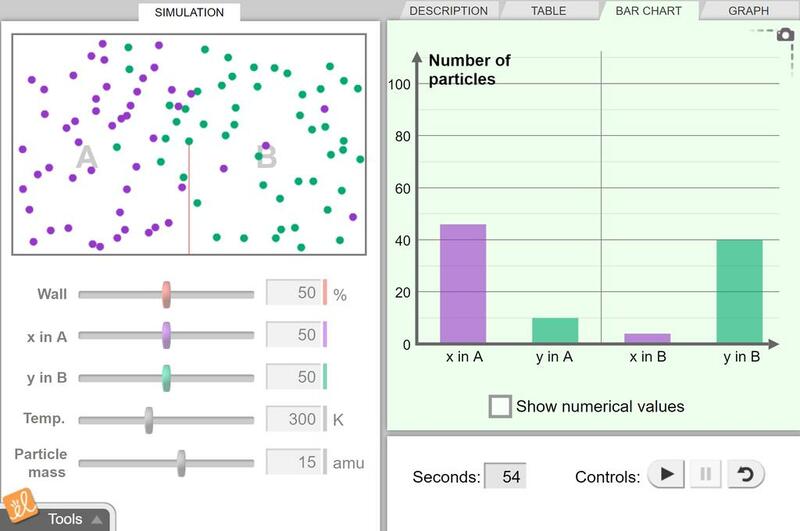 The mass of the particles can be adjusted, as well as the temperature of the room and the initial number of particles. In a real-world context, this can be used to learn about how odors travel, fluids move through gaps, the thermodynamics of gases, and statistical probability. Simplified diffusion SE for biology students (doesn't have mass or temperature foci). How can I set up a controlled experiment to test how one variable can affect diffusion? I revised activity B to reflect the AIM and the Do Now. I incorporated 2 Regents questions for the Do No... (more)w. Activity B is a great revisit and practice for Experimental design. How does temperature affect diffusion? In my school we use Aims and Do nows therefore I revised the worksheet to reflect that. I only needed to ... (more)do activity A with my students, which is why I chose the title (AIM) above. I clarified some of the questions so they are not so open ended so that a student may answer them more cl... (more)early. A teaching vignette with activities, discussion questions, and investigation ideas for teaching the cell ... (more)transport systems of osmosis and diffusion. An excellent review and lab activity for grade 11 biiology. Students enjoyed it.